Railways as an Engine of Economic Growth? Who Benefited from the Canadian Railway Boom, 1870-1910? Jack R. Censer and Jeremy D. Popkin, eds. - Press and Politics in Pre-Revolutionary France. 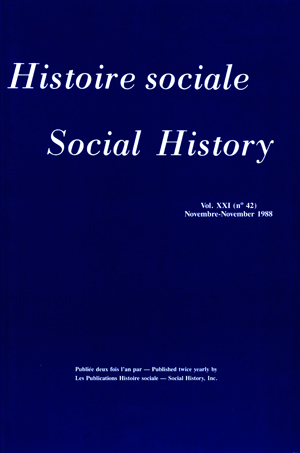 Richard Harris - Democracy in Kingston: A Social Movement in Urban Politics, 1965-1970. Allan K. Wildman — The End if the Imperial Anny. The Rood to Soviet Power and Peace. Virginia Berridge and Griffith Edwards — Opium and the People: Opiate Use in Nineteenth-Century England. Janet Ajzenstat — The Political Thought of Lord Durham. Georges-Émile Lapalme — Pour une politique. Le programme de la Révolution tranquille. Susan Cahn — Industry of Devotion: The Transformation of Women's Work in England, 1500-1660. Joan M. Jensen — Passages from India: Asian Indian Immigration in North America. Bruce S. Elliott — Irish Migrants in the Canadas: A New Approach. William Kaplan — Everything That Floats — Pat Sullivan, Hal Banks, and the Seamen's Unions of Canada. Brian C. Mitchell — The Paddy Camps: The Irish if Lowell, 1821-1861. Joshua A. Fogel, ed., transl. — Life Along the South Manchurian Railway: The Memoirs of Itō Takeo. Abraham Ascher — The Revolution of 1905: Russia in Disarray. Natalie Zemon Davis — Fiction in the Archives. Pardon Tales and Their Tellers in Sixteenth-Century France. Clifford Geertz — Works and Lives: The Anthropologist as Author. Myron P. Gutmann — Toward the Modern Economy: Early Industry in Europe, 1500-1800. Robert Colls — The Pitmen of the Northern Coalfield: Work, Culture, and Protest, 1790-1850. Gary Burrill and Ian McKay, eds. — People, Resources, and Power. Critical Perspectives on Underdevelopment and Primary Industries in the Atlantic Region. Jeremy Black — The English Press in the Eighteenth Century. Donald H. Akenson — Small Differences: Irish Catholics and Irish Protestants, 1815-1922.